I had other plans for April, some idea of what this month might be about for me and my family. What I'm finding is that pushing that plan is tragically, comically painful. On the other hand, what is showing up without any effort at all, is quite lovely. 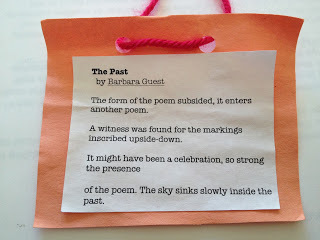 April, National Poetry Month. I'd be hard pressed to conjure up something, from inside my own head, that I'd enjoy celebrating more than a month full of poetry. So welcome to April on my blog. A month of Monday poems. Starting with the one I found hanging from the tree at the end of my block. 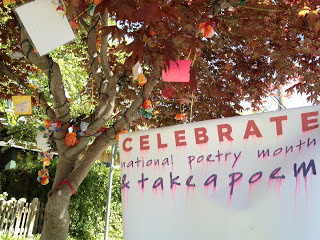 (I know, it's hard to believe, but I live on a block where poetry grows on trees. You should see it for yourself sometime). The sky sinks slowly inside the past.